Product information "Smoke Sensor with siren function"
When a fire breaks out, the Smoke Sensor with siren function can save lives. In the case of smoke by fire every second counts to extinguish small fires itself, or to bring themselves and others to safety. An inattentive moment or a short circuit that can not be prevented: The potential causes of household fires are manifold. Open fire from candles or fireplaces, a forgotten iron, various kitchen appliances or other electrical appliances can unintentionally trigger fires. The Smoke Sensor with siren function detects reliably smoke developments and developing fires. In an emergency, it alerts acoustically and automatically sends a signal to all smoke detectors in range, so that they also trigger an alarm. This ensures that all persons, even on a different floor or at night while sleeping, perceive the alarm sound. Thanks to Z-Wave technology, you can use the Smart Home Center to carry out further actions in the event of an alarm. Secure escape routes by illuminating them automatically, raising blinds and shutters and unlocking doors. 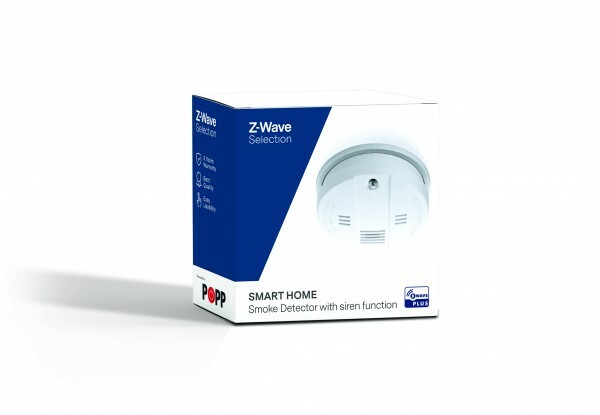 In addition to the smoke detection function, this Z-Wave device can also be used as an independent indoor siren and integrated into an existing security system. Independently of the control unit, you can link the smoke detector to other sensors such as window and door contacts or motion detectors in your Z-Wave Smart Home. Smoke detectors can save lives, because every second counts in the case of a fire. Make your home or place at work safer with a Smoke Sensor with siren function. Related links to "Smoke Sensor with siren function"